The 2.5 SkyActiv-G (the PY-VPR and PY-VPS) is 2.5-liter gasoline engine which was firstly introduced in the Mazda KE CX-5 and the GJ Mazda6 in 2012. 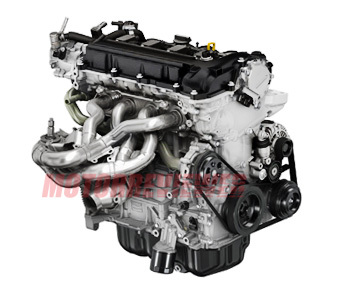 This engine shares the same technologies and ideas which have already been presented with the 2.0 SkyActiv-G. But the 2.5-liter engine is not only bigger displacement engine, but it also has unique features. First of all, SkyActiv 2.5 came to replace the L5-VE engine. Like its predecessor, the new engine has an aluminum alloy cylinder block with 4340 steel-molybdenum alloy bores. Also, this big four-cylinder SkyActiv-G engine has a balancer unit. It consists of two the crankshaft gear-driven balancing shafts that rotated at twice the speed of the crankshaft. The block has bigger bore and stroke to provide the capacity of 2488 cc. All internal components are lighter and stronger now. There is a forged steel crankshaft, forged connecting rods, and aluminum pistons. The friction of the bottom end was reduced by 30 percent. The engine has cylinder head quite similar to the two-liter version. It made from aluminum-silicon, two overhead camshafts, four valves per cylinder, rocker arms which featured needle roller followers. The 2.5 SkyActiv-G got variable valve timing system, Mazda's 'Dual Sequential Valve Timing' (Dual S-VT). The fuel system was also upgraded. There is direct fuel injection system which injects fuel directly into the combustion chamber. The system includes very productive high-pressure fuel pump and the injector nozzles with six holes for better air and fuel mixture. The engine marketed under the 'SkyActiv-G' label because of the unusual for gasoline engine compression ratio - 14.0:1 (13.0:1 for the US, Canada, and Australia). Another unique feature of this engine - it has sporty, long 4-2-1 header (exhaust manifold). This exhaust system 4-2-1 is designed to prevent the recirculation of hot exhaust gases and gas remaining inside the combustion chamber. But this causes disadvantages in environmental performance. The long distance between the engine and the catalytic converter makes exhaust gases cooler and not hot enough to heat fast the catalytic converter in first minutes of operation. At cold operation, The 2.5 SkyActiv-G engine raises the temperature of the exhaust gases by delaying ignition timing. So the hot gases warm up the catalytic converter a much quicker. Special note to the idle stop and restart system of the engine. Mazda’s i-stop used combustion as a part of idle stop system in combination with the electric-powered starter motor. The system can identify which cylinder was in the correct stroke position, and after that injects and ignites fuel into the cylinder. That provides less wear on the starter motor and the best restart times in the industry for the SkyActiv-G (0.35 seconds). The new Mazda 2.5 liter SkyActiv engine doesn’t have a long production history yet. In this short period, there are no meaningful issues and problems mentioned by car owners or the manufacturer. The SkyActiv series shows itself as a good and reliable engine with low fuel consumption and maintenance cost for a mid-size sedan and an SUV. SkyActiv-G 2.5T - 2.5 liter turbo engine. 250hp/ 5,000 rpm; 310 ft lb (420 Nm)/2,000 rpm. You can read about this engine here. PY-VPR - SkyActiv-G 2.5 engine version which powered the Mazda GJ Mazda6 - included Mazda’s ‘i-ELOOP’ (Intelligent Energy Loop) brake energy regeneration system.